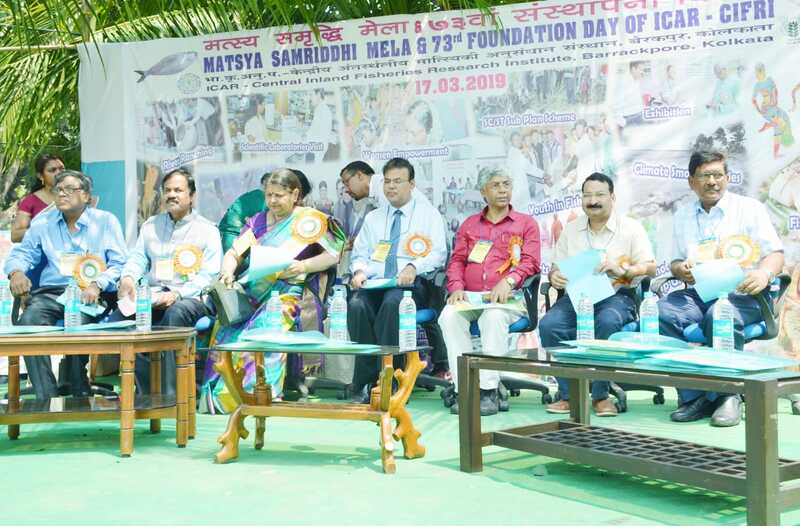 ICAR-Central Inland Fisheries Research Institute, Barrackpore Celebrated its 73 rd Foundation day with organizing Matsya Samriddhi Mela on 17 th March 2019. 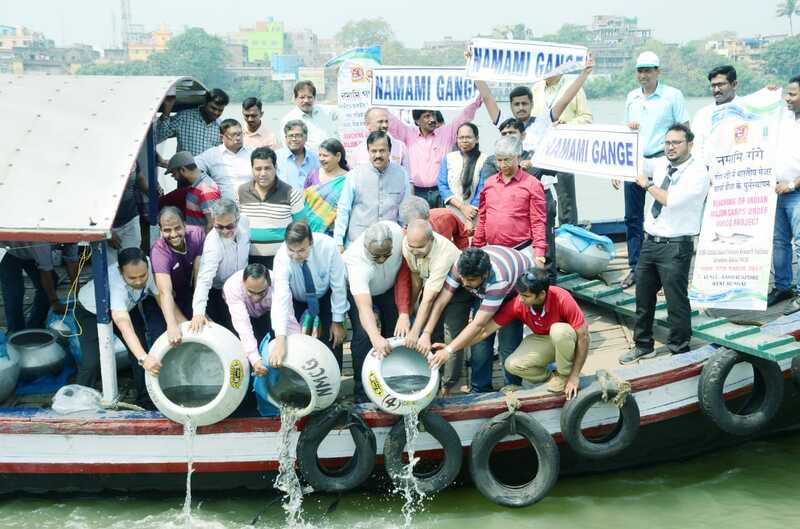 The grand ceremony was inaugurated with ranching of 30000 advance fingerlings of Indian major carp seed in River Ganga by the honourable guests at Barrackpore ghat. 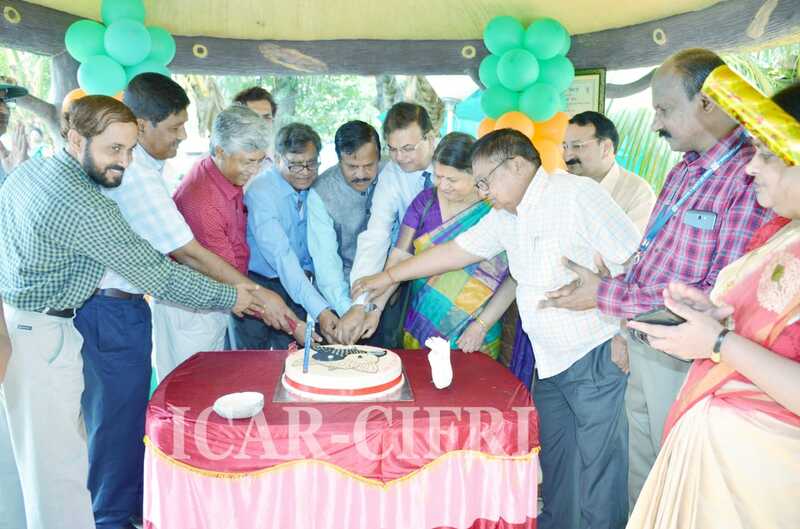 The foundation day cake was cut by the Director CIFRI and honourable guests at the knowledge point. In his welcome address, Dr. B. K. Das, Director CIFRI, Barrackpore congratulated all CIFRIans, Progressive fish farmers, fisheries industries, etc. who were part of the momentous 72 years journey of ICAR-CIFRI success story. The Director, ICAR-CIFRI briefed about the the achievement and continuing efforts towards second green revolution. 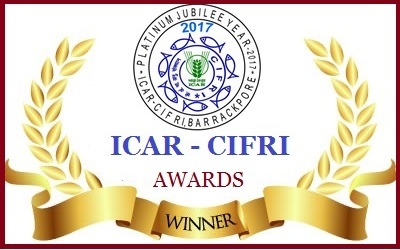 Dr. Vijayalakshmi Saksena, General President (Elected) of Indian Science Congress and Chief Guest of the function in her address congratulated Director and all the staff members of ICAR- CIFRI on this momentous occasion. She stressed that ranching efforts in will pave the way for improved fish diversity in river Ganga. 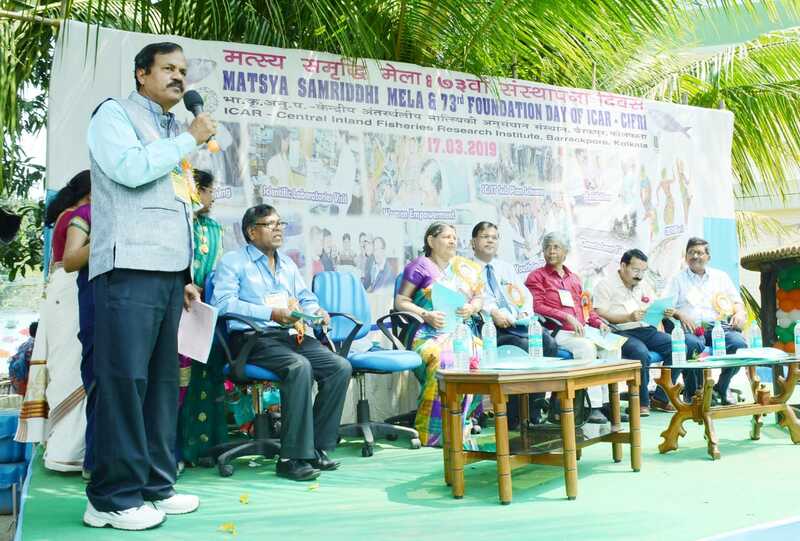 Dr. N. Saha, Vice Chancellor, Burdwan University and Guest of honour in his address congratulated ICAR-CIFRI for organizing Matsya samriddhi Mela on a large scale with participation of more than 2500 farmers. Dr. Ashok Kumar Saksena, Former General President of Indian Science Congress and Guest of honour in his address congratulated CIFRI for organizing this Mela on such a large scale and creating awareness among farmers for second green revolution. Dr. Subrata Mndal, Chief General Manager, NABARD, Kolkata in his address complimented CIFRI and extended NABARD support for various programmes. 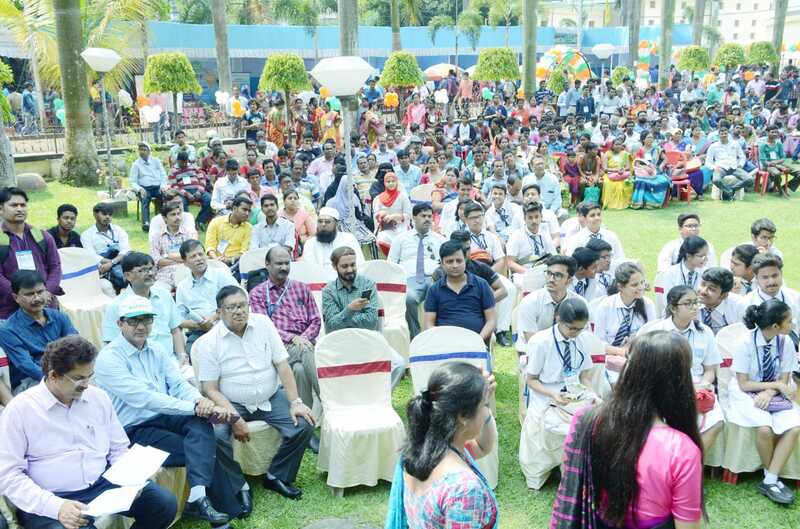 Shri Navin Nayak, Director, Nehru Yuva Kendra, West Bengal and A & N Islands informed the gathering that 800 youths has been trained by ICAR-CIFRI in 2018-19. He said that next year NYK will send 1000 youths for this training programme. Shri Bablu Majumdar, Awardee Fish farmers addressed the gathering about his achievement through the help of ICAR-CIFRI. He informed the gathering that at present many fishers are getting field training at his farm. Dr. B. P. Mohanty, Head, FREM division presented the vote of thanks. The Fisheries Exhibition was inaugurated by the galaxy of guests. Number of exhibition stall has been installed encompassing live fish, Hilsa life story, ornamental fish unit, feed companies, fish health units etc showing their products to fish farmers. As a part of Mela, Farmers scientists interaction session, Industry interface meet, Women fishers session were organized where various progressive fish farmers informed about their achievement. Around 2000 farmers including 100 progressive fish farmers, 300 students of different universities, 200 youths, entrepreneurs, fish traders, fish processors, SHGs, ornamental fish growers and hatchery owners have participated in the event. 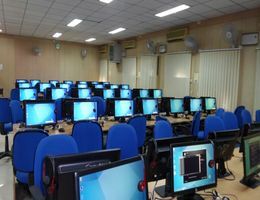 CIFRI, since its inception has generated very useful inland fishery technologies on induced breeding and fish seed production; Composite fish culture; Fish seed prospecting and spawn collection in rivers; Reservoir and floodplain wetland fisheries management and In situ fish seed production in cage and pen. The institute has also developed relevant guidelines for sustainable management of inland fisheries management. Dr. V.G Jhingran, the then Director created history in the Annals of Fishery Sciences by receiving Padma Shri Award on the Republic Day of 1977 for his outstanding contribution in the field of inland fisheries. 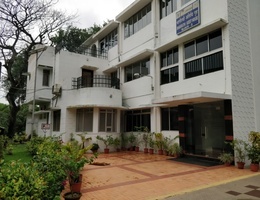 The P & T Department, Government of India, released a special postage stamp of 5 paise denomination on 26 th November, 1979 in the fitness of things and as a token of recognition of the pioneering work of CIFRI in the field of aquaculture.